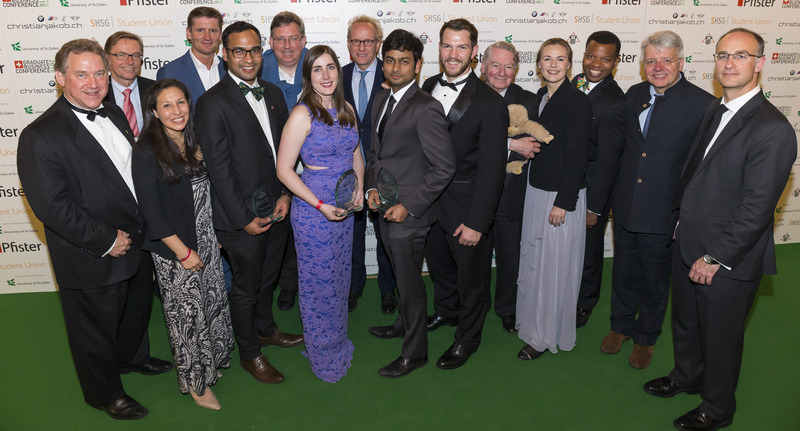 Student leaders from Georgetown University McDonough School of Business, the London School of Economics and Political Science (LSE) and The Chinese University of Hong Kong (CUHK) received top honours for their contributions to the areas of responsible leadership, sustainability and student government at the 2016 Graduate Business Conference (GBC2016) of the Graduate Business Forum (GBF) hosted by the University of St. Gallen in Switzerland. The 2016 GBF Leadership Awards, in honour of this years’ student leader achievers across the top business schools around the world, were presented by Jim Deveau, GBF Founder, Wieteke Dupain, GBF CEO, and Prof. Dr. Kuno Schedler, Vice President Research & Faculty at the University of St. Gallen . Established in 1983, the Graduate Business Forum (GBF) (www.graduatebusinessforum.com ) is a global organization dedicated to developing responsible leadership and global citizenship, with influence, through an exclusive network of student leaders and alumni from the world’s top 50 business schools. The GBF runs a number of activities to support the development of leadership skills for business school students through newsletters, shared knowledge platforms and networking events including the annual Graduate Business Conference (GBC ), hosted by one of the GBF member schools, drawn from the top 50 business schools and MBA programs globally. The Awards are open to full‑ time graduate business students of GBF member schools participating in the annual Graduate Business Conference. The award is presented at the GBF Student and Responsible Leadership Awards Commemorative Banquet and Gala at the annual Graduate Business Conference. Previous presenters of the Awards include HRH Crown Prince Frederik of Denmark, CEO of Bayer Greater China, Celina Chew and Ken Morse, serial entrepreneur, Professor and Member of the National Advisory Council on Innovation and Entrepreneurship supporting Barack Obama's innovation strategy.